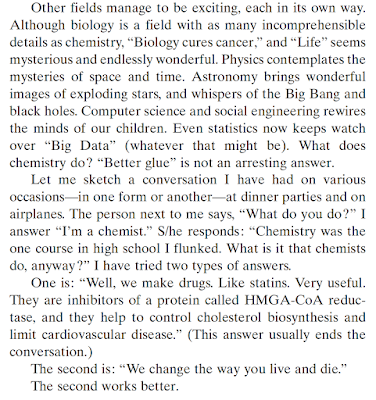 The Curious Wavefunction: George Whitesides: "Chemists - we change the way you live or die"
George Whitesides: "Chemists - we change the way you live or die"
I don't know if I have highlighted this eminently readable quote from a review on the future of chemistry by the always interesting George Whitesides before, but it's quite memorable, not just because it dramatically illustrates how chemistry contributes to our world but also because it accurately does so. Whitesides is talking about an old and thorny problem: how to pitch the wonders of chemistry to a public which often thinks that while physics is about the universe and biology is about life, chemistry is about glue and vitamins. How do we convince people not just of the practical utility of chemistry but also about its vast reach as the "central science". Whitesides's advice is to try out the line at the end of the following exchange on your next trans-Atlantic flight fellow passenger. To me, the beauty of that statement is not just that it encompasses the ubiquitous and deep role that chemistry plays in human life and death but that it also satisfies a key constraint from the philosophy of chemistry: that of representing the discipline at the right emergent level. 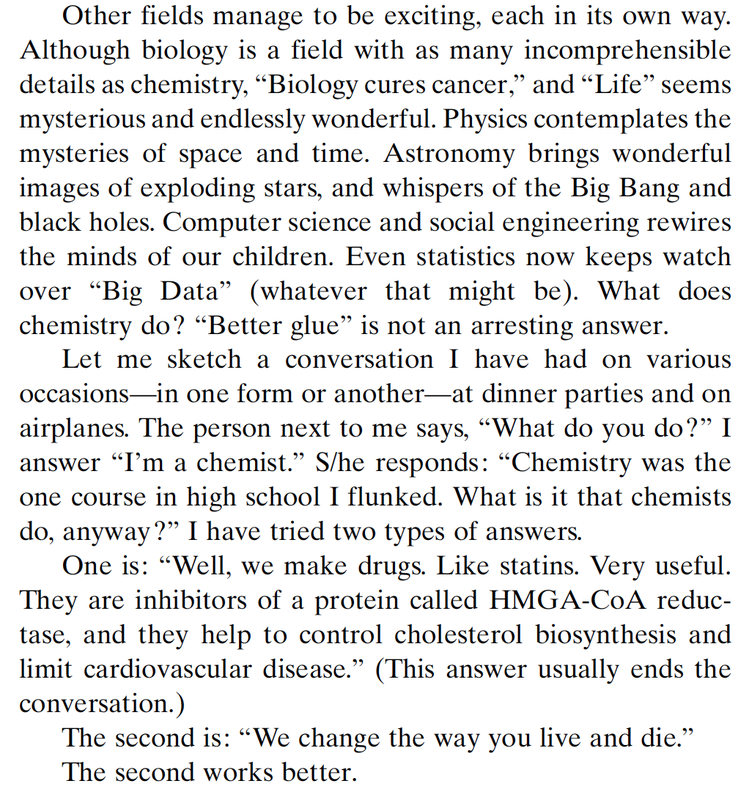 What I mean is that it would be trivial to say that the statement "We change the way you live or die" could encapsulate physics and biology even better; after all there would not be life or death without evolution, and even less so without the second law of thermodynamics. Yet not only does chemistry serve as the major workhorse for both evolution and the Second Law but it also contributes to life and death at a very direct level, as opposed to an abstract if very general one. The ATP, glucose and water molecules coursing through your body can put a chokehold on your very ability to live right away if their number dwindled. So can the molecules in your food supply or your environment. They are life-giving and life-depriving in a very real sense unlike the laws of physics and biology which, although they may be more generally encompassing, don't describe the system at the right explanatory level. It is the combination of pleasing philosophical applicability and damning practical applicability that make that quote feel as satisfying to me as a Bruce Willis quote on living and dying from "Die Hard".